MRS-31 TEK ELITE Glamour Clearcoat has exceptional leveling characteristics, excellent gloss retention and D.O.I. It is formulated with innovative resins and UV stabilizers to provide a durable, long-lasting finish. 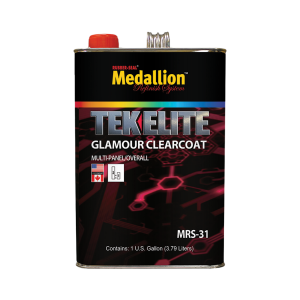 MRS-31 TEK ELITE Glamour Clearcoat is ideal for multi-panel or overall refinishing and can be used as an air dry or bake system clearcoat. It mixes at a 2 to 1 mix ratio with a temperature control activator system MRS-60 Fast, MRS-75 Medium, MRS-90 Slow. MRS-31 TEK ELITE Glamour Clearcoat is available in gallons and quarts.